As I've not made an effort to leisurely visit Europe in almost 20 years, this was a good trip for a refresher and furthermore, this was a trip to visit the home of multi-million Euro custom yachts, or what I call, 'floating sea mansions'. I was to experience 6 brands, 1 design architect and 1 naval architect inside a week. So, for me, this was an educational trip on custom yacht building, all thanks to Mr. Oh Kean Shen of Pen Marine. For him, it was a trip to show a mutual friend & client the art and the extensive possibilities of custom building a yacht. 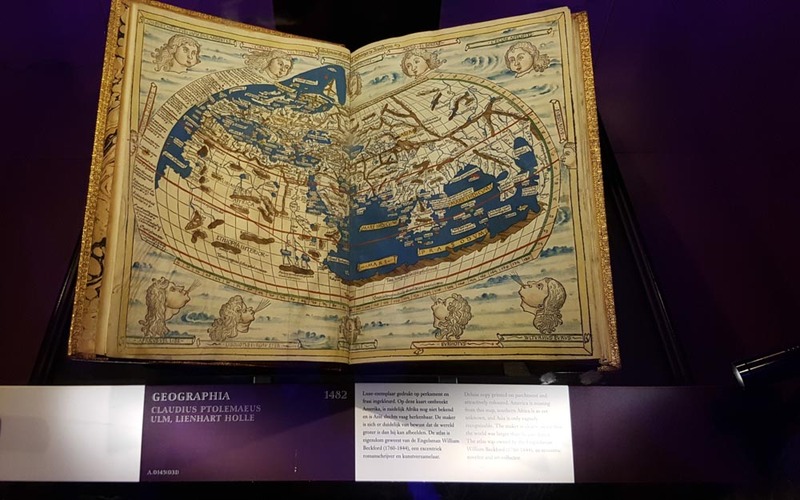 There were tons of knowledge learnt on this trip and I feel obliged to share a little journal account of that exciting week. We were greeted by queues of Teslas upon our arrival, a refreshing sight compared to the usual smell of diesel. Frank Laupman, an architect extraordinaire, was enroute to pick us up but was caught up slightly in traffic. After a short wait, Frank arrived - in a Tesla and it was my first time ever in one. The best word to describe it is indeed a technological amazement, a review for another day of course. The first day was spent entirely at Omega Architects, situated in the quaint town of Druten - about one hour's drive from Schiphol Airport. Omega Architects is the same team who have produced quite a number of award winning designs, from interior designs, yacht designs and architectural designs. Exclusive information on the firm can be found in our recent Magazine. Frank further spoke to me casually about a current work in progress, a superyacht design commissioned by his client which was inspired by the Lamborghini Aventador, and to be asked for my opinion, I was honoured. Why the Lamborghini Aventador? Frank said that this particular client has 100s of supercars & collectibles, but chose on the Aventador because of its bold & sharp design lines. Highlight of this first day were the three meetings we had in getting to know the shipyard's owners/managers and an introduction of their history & capabilities; a greet and meet before the actual shipyard visit to view the daily operations and actual craftsmanship and capabilities. 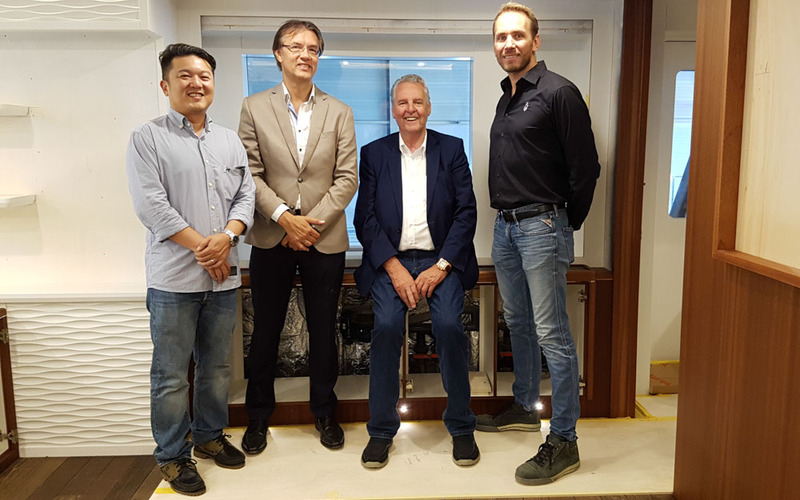 The three meetings were with Van der Valk, Moonen and Storm Yachts. It started early with breakfast at De Twee Linden and a brisk walk around town with Mr. Oh while awaiting for Niels Moerke of Van Oossanen to arrive. 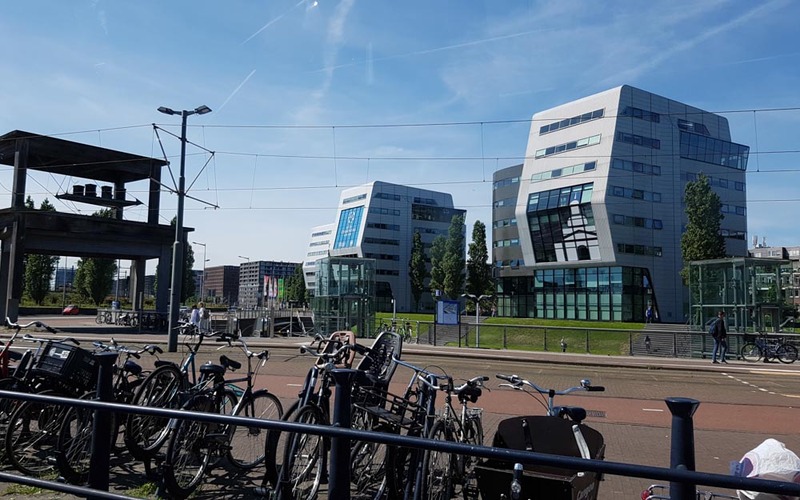 Day 2 would be the final day of in-office, sit-down meetings, and this round, it was to be held at Van Oossanen's HQ - Wageningen. Along the scenic route filled with wind turbines and dairy cow fields, we made an abrupt stop over a small stall selling freshly picked berries from the farm right behind the stall. Cherries, strawberries, raspberries - red succulent cherries primarily. Once we arrived at Van Oossanen, we got straight into it. 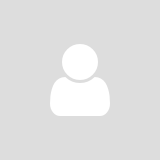 Van Oossanen are naval architects - specialising in fluid dynamics & naval architecture. In layman terms, efficiency and performance of sea going crafts. Founded by Piet van Oossanen, now it is headed by Perry van Oossanen and Niels Moerke. 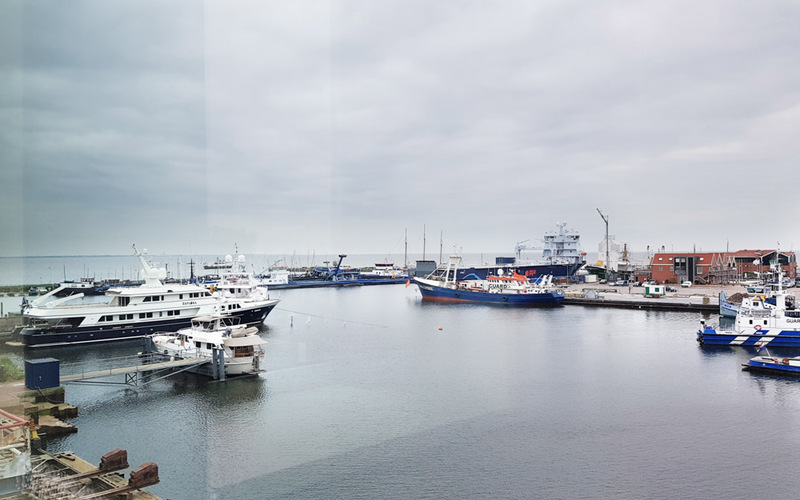 When visiting these offices, you can't help but realise the accomplishments - hung at the wall was a big canvass with side profiles of different boats and ships - all which have been worked upon by Van Oossanen. One that particularly caught my eyes was the Mercedes-Benz Style luxury yacht "Arrow460 Granturismo". You can learn more of Van Oossanen in a more in-depth article in our Magazine. 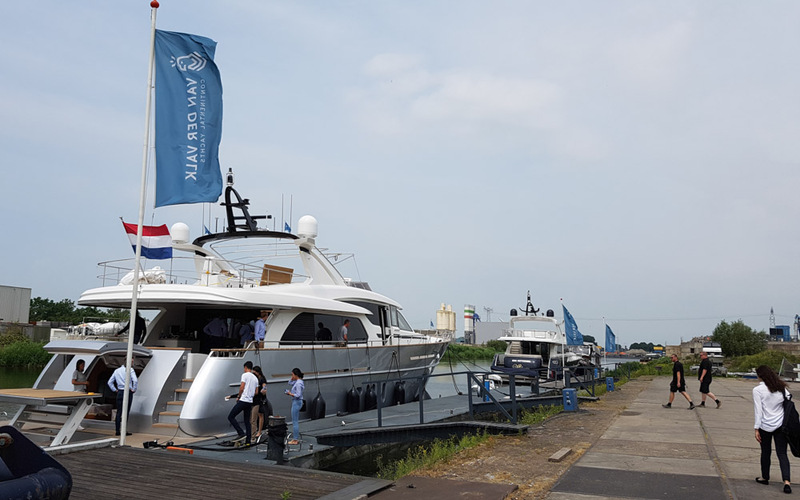 The first shipyard we visited was Van der Valk in Waalwijk, which was about an hour's drive from the hotel itself. 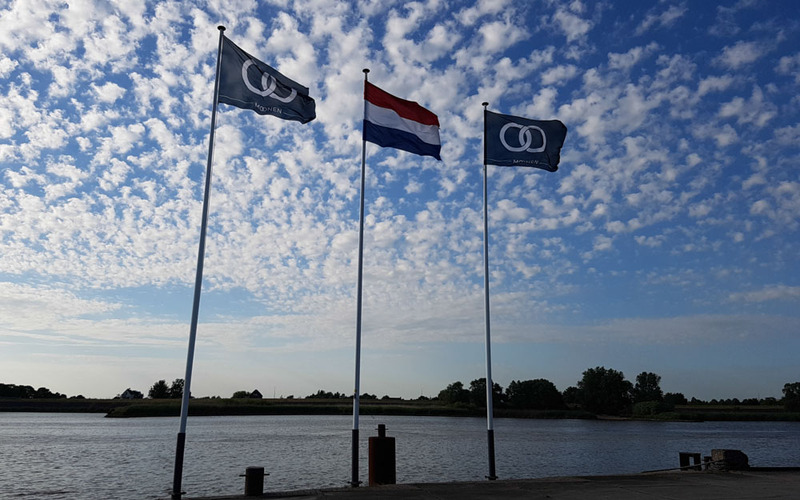 There, we were greeted with the sight of a Malaysian flag been hoisted up full mast at the Van der Valk facility. We were welcomed by Patrick Lankhuizen (Director of Sales) and Bram Kooltjes (Production Manager). We had also an opportunity to meet Mr. Wim van der Valk, the founder of Van Der Valk shipyard we were touring. Three yachts of various sizes were being built as we saw on the tour, with a few ready outside at the riverbank. 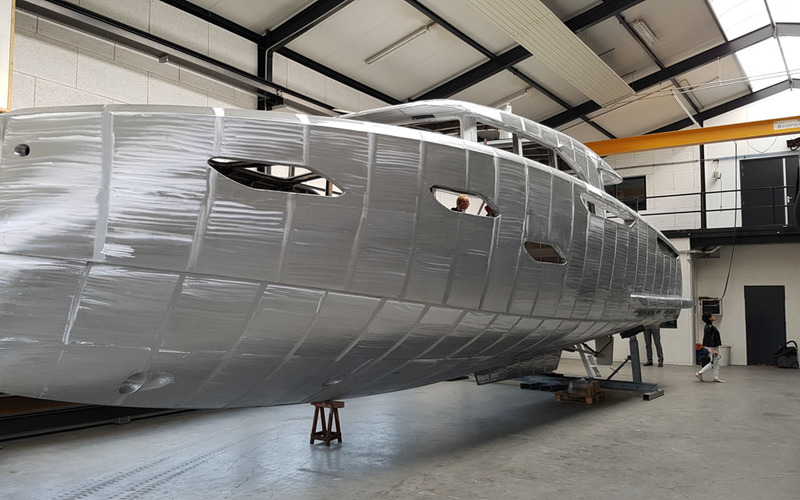 Van der Valk utilises steel or aluminium for their hulls and aluminium for their superstructures, with capabilities to build yachts of up to 40m. 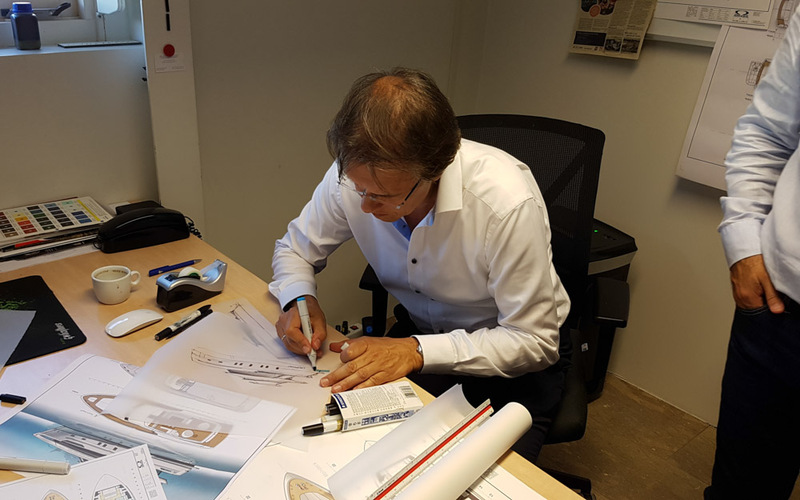 It is during the shipyard visit that one can actually go into the details of the processes in place and the minute details of the Dutch craftsmen, which actually heightens one's appreciation towards the building of a yacht. This shipyard tour took close to about a good hour or so, as there were much questions being asked by our friend-client, a good sign of real interest from him. Our second shipyard tour was at Storm Yachts, which was just right behind, within the same vicinity. It is a smaller shipyard run by two passionate friends, Rob van Kesteren and Corné Knippels. Being small, the attention to detail however, was second to none. We were taken through a tour for the yacht under construction, and the detailing was impeccable. Once again, our friend-client was enthusiastic about his questions, hence prolonging our stay at Storm Yachts a little longer. The third shipyard we visited was Moonen. Moonen has two shipyards, but we were taken to Groot-Ammers, which was about 45 minutes northwest from Waalwijk. Moonen's Groot-Ammers facility was huge, biggest of the lot we had visited at that point. The odd part of it all was that it wasn't busy. There was however a superyacht inside the shed - about 60% completed. 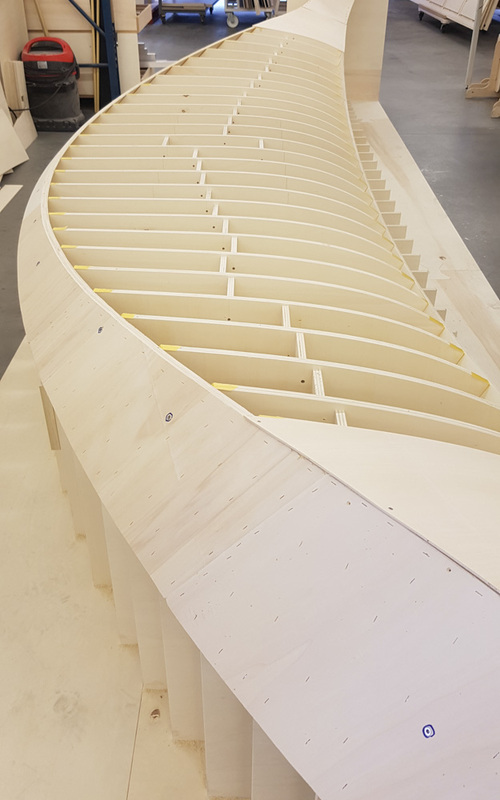 We were taken for a tour, and upon explanation, we learnt how the interior of Moonen yachts are actually drawn out, and laser cut to precision (the floorboards of the yacht in itself is a scaled up laser etched drawing of the blueprint), before assembly. 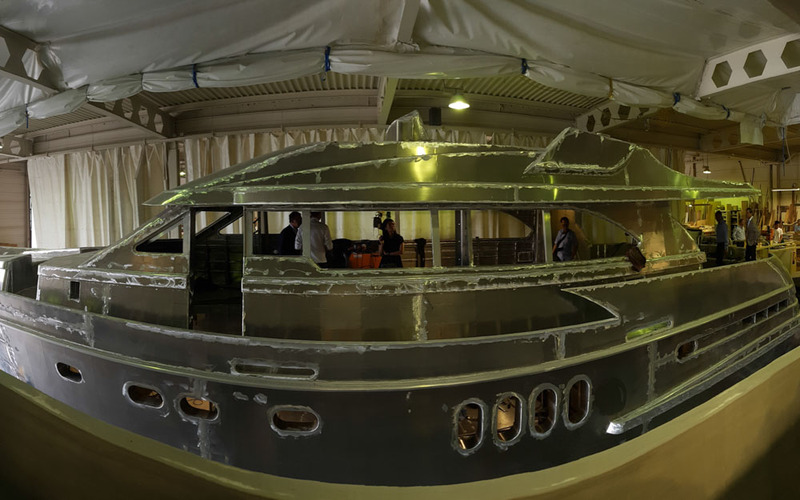 The first shipyard on Day 4's list was one that had me very excited: Heesen Yachts, as they are considered to be the #1 aluminium custom yacht builders in the industry, (building nothing less than 40metre yachts). The journey took us south-bound towards Oss, where Heesen Yachts is based, a cool 45-minute drive. There it was, a grand big signage that greets visitors and customers: Heesen Yachts. The introductions were made by Johan Kaasjager, a representative of Heesen and also a friend whom I met two years ago. Within the office space itself, I chanced upon a mock interior with the various materials the brand work with. Heesen's shipyard is enormous, and very professionally managed. At any one point in time, five mega yachts were being worked upon simultaneously, each with its own launch countdown ticking away. 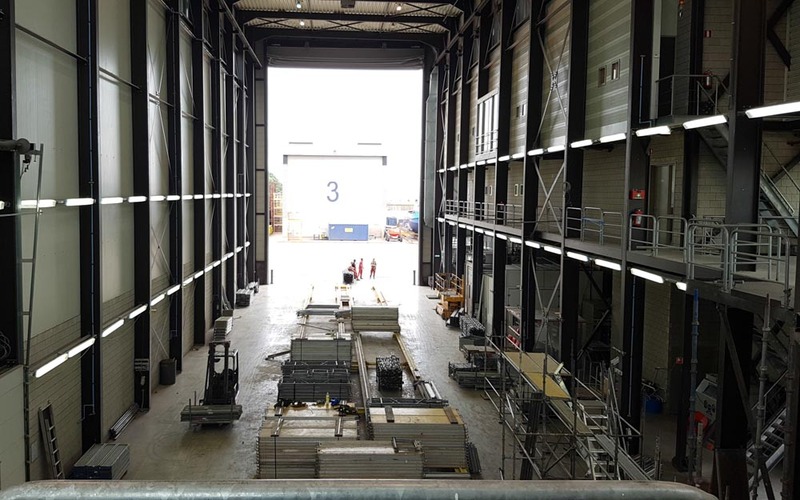 There is even a dedicated aluminium work hall and carpentry hall, unlike the previous shipyards we had visited which makes it the most impressive in this tour roster. However, as mentioned, they do not build below 40-metre yachts, and the price point for Heesen is rather high but rightfully so, as their standards are also to the highest as I've witnessed now in the flesh. 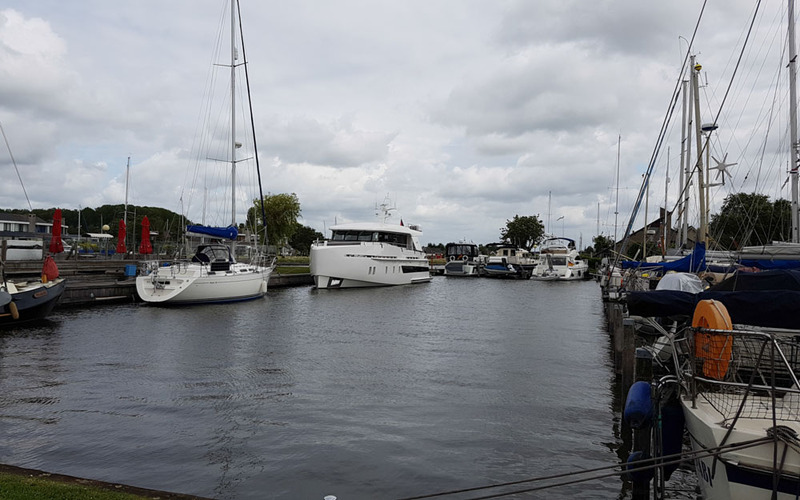 After a botched sea-trial, due to bad weather, we then headed to Jetten Shipyard in Sneek. There, we were greeted by Jeannot Grim, Managing Director of Jetten Yachts upon our arrival. It is a medium-sized shipyard and still growing, building aluminium and steel yachts. We toured the shipyard briefly in the evening, as well as three of their moored yachts. Two yachts were on the way to completion, however, due to the time we had arrived (late afternoon), it was pretty much quiet. 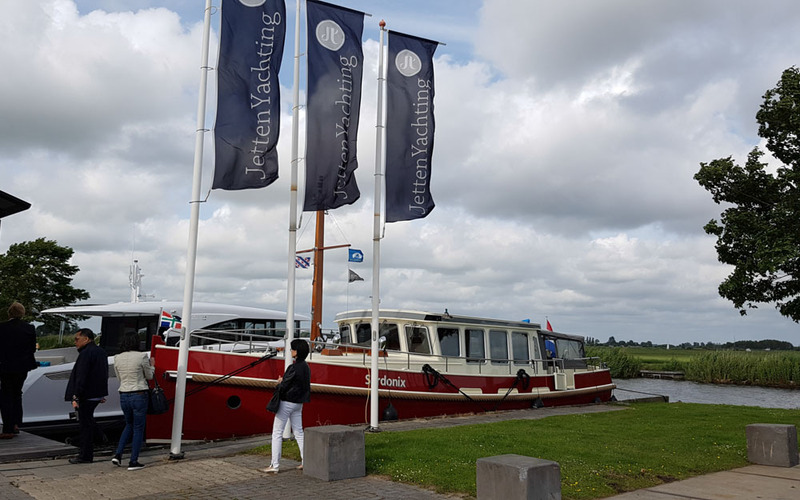 Our sea trials here took place on the Jetten Beach, cruising out to Sneekemeer, a lake with multiple river ways leading to other towns. It was a blissful experience to say the least, one that evokes feelings of freedom; having the setting sun and the cool breeze against your skin, with views of classical sail boats enjoying an evening sail with seagulls trailing the yachts. The Jetten Beach was rather smooth, and quick to the throttle as well. However, due to restrictions of the lake (one of which is no speeding, as it creates waves affecting other smaller sail boats), it was only a short stretch that we could sample the speed. This was to be the day of our final shipyard visit- Balk shipyard, situated in Urk, which is slightly northbound. Balk is a family run shipyard, and it dates back all the way to 1798, currently run by its 8th generation Balk- Daan Balk. 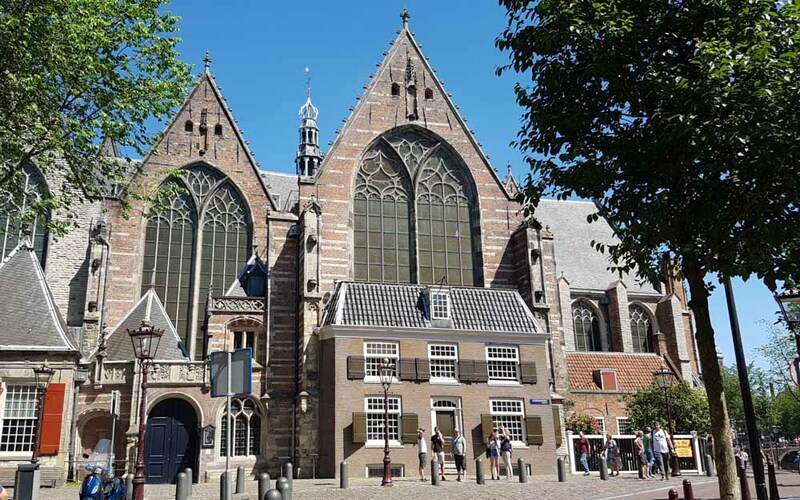 It is also a shipyard by appointment to the Court of Netherlands and also has also been presented with the unique opportunity to build a ship in honour of Queen Beatrix's silver jubilee. Balk does majority refitting works - for yachts like Feadship (which says a lot coming from the world's best in steel). 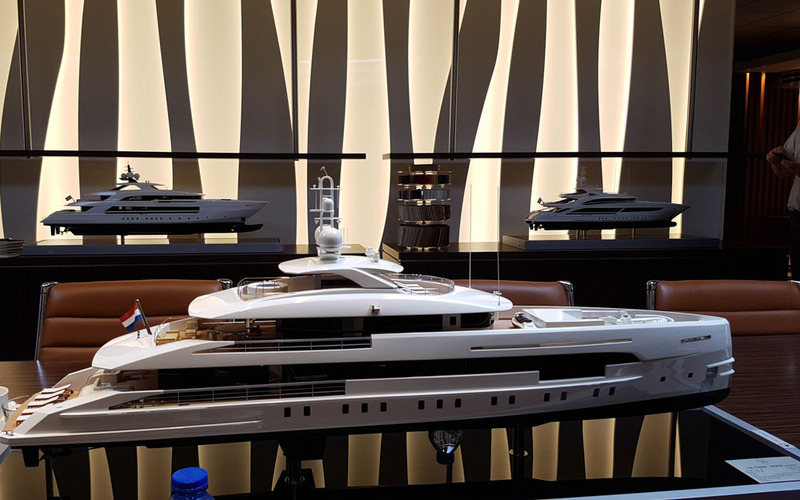 The shipyard is as you can imagine, humongous, and stands at least four stories high, with two halls for refit works for yachts up to 45-metre and 65-metre range, and a construction hall. From what I witnessed, passion fills the humble craftsmen at Balk. After all, it's a long line of history, having come to this day from 1798, two centuries now in 2017. After the Balk shipyard visit, we made our way to Amsterdam to visit the Maritime History Museum (Het Scheepvaartmuseum in Dutch). 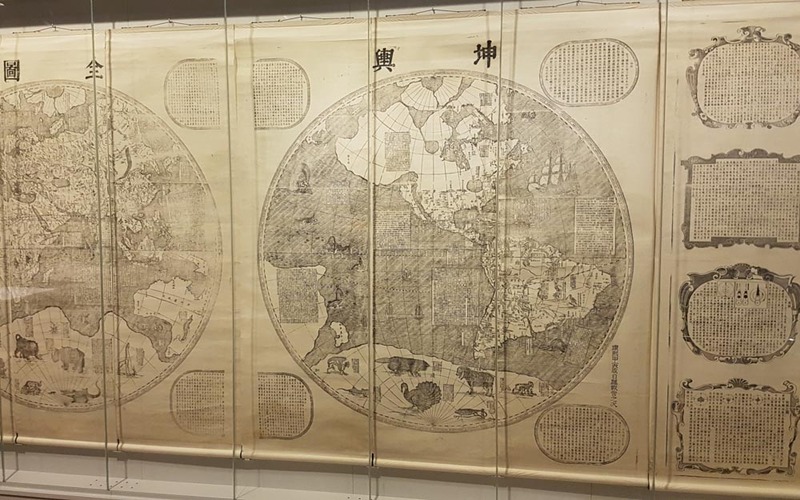 To see actual paintings of maritme history, one of which was the first map of the world, it was only fitting that we spent the whole afternoon at the museum, which honestly, isn't quite enough. It was here where we parted ways with Niels and Frank who was with us the entire time from day one. Nontheless, I can tell you that this Netherlands shipyard excursion has elevated my knowledge on the process of custom yacht building. More so, it has made me appreciate what the craftsmen do in their trade. From Mr. Oh, who's passionate on assisting people build dreams, Frank Laupman of Omega Architects (look out for a story on them in this same issue) and Niels Moerke (a story on Van Oossanen Naval Architects also in this issue), to the very people cutting wood, welding steel, shaping teaks; with this knowledge, hopefully someday, I'll be able to guide interested parties in building up a custom yacht, and maybe even my own.